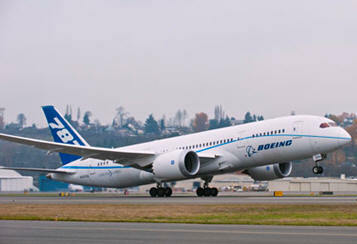 December 11, 2011 - Boeing has established two world records with the 787 Dreamliner, setting new marks for both speed and distance for the airplane's weight class. This week, Boeing’s new 787 Dreamliner powered by GE’s GEnx engines took off from Seattle for a record flight to circumnavigate the globe. The plane stopped only in Dhaka, Bangladesh for two hours of refueling. The flight set two new world records for its weight class in nonstop distance flown and speed for an eastbound flight around the world. "Speed and distance capabilities are fundamental to the value the 787 brings to the market," said Scott Fancher, vice president and general manager of the 787 program. "These records are a great way to demonstrate that this airplane is the game-changer we have promised." The sixth 787, ZA006, powered by General Electric GEnx engines, departed from Boeing Field in Seattle at 11:02 a.m. on Dec. 6 and set the distance record for its class with a 10,710 nautical mile flight to Dhaka, Bangladesh, with credit for 10,337 nautical mile. This record had previously been held by the Airbus A330 based on a 9,127 nautical mile flight in 2002. Following an approximately two-hour stop for refueling in Dhaka, the airplane returned to Seattle on a 9,734 nautical mile flight. The airplane landed at 5:29 a.m. on Dec. 8, setting a new record for speed around the world (eastbound) with a total trip time of 42 hours and 27 minutes. There was no previous around-the-world speed record for this weight class. The 787 carried six pilots, an observer for the National Aeronautic Association (NAA), and operations and other Boeing employees – 13 people in total. Flight routing on the first segment of the journey took the airplane from Seattle across the U.S. to Nantucket. After crossing the Atlantic Ocean, the airplane entered European air space at Santiago, Spain, and proceeded down the Mediterranean, across Egypt to Luxor, across the Middle East and over India to Bangladesh. On the second segment, the Dreamliner flew over Singapore, the Philippines and Guam before entering U.S. airspace over Honolulu and returning to Seattle. Boeing holds world records for longest distance flights in five weight classes with records set by the KC-135, 767-200ER (extended range), 777-200 and 777-200LR (longer range). The 777-200 also holds the speed record for its weight class.